FTA Cho Oyu 2010 - Lonely in C1! Our team is enjoying a nice evening in C1 where there remain just 15 tents in a place which only a few days ago was crowded with 100+ tents. In the morning they will move up to C2, complete their acclimatization, and descend to ABC on the 2nd. They are all feeling strong and hopeful that there will be some dramatic change in the snow conditions in the week ahead. A period of lower winds if being forecast for around the 6th or 7th of october and they will position themselves for summit bid at that time. A few well respected and strong climbers have been higher on the hill (upwards of 7800m) and continue report conditions that do not allow for a safe summit bid at this time. One climber dug a snow pit near C3 revealing a 10cm crust over 30cm of unconsolidated snow along with several other shifting layers - not a pretty sight! With the time running out for many other teams most have had to pack it up and head home. We still have 10 days until we need to leave the mountain and will hope that the winds and sun work on the snow pack to allow a possible summit bid. Stay tuned for more news ahead! Fabrizio has left a dispatch from C1 with the latest news inlcuding the latest on the team, the conditions and the big BC party hosted by the TMA! We are now confirmed for Nanga Parbat 2011 June/July expedition with Fabrizio Zangrilli and accepting applications for fully guided, full mountain support and bc support options. We are nearing confirmation for Broad Peak for 2011 June/July with Chris Szymiec and expect to confirm well ahead of the end of the year. This will be our 7th trip to Broad Peak (and Chris's 3rd!) 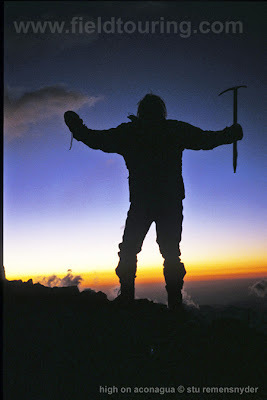 and we invite you to join Chris and FTA for a great 8000m climb! We still have a few spaces on our confirmed Nov 4 Ama Dablam Expedition! see our site www.fieldtouring.com for more! I have had a call from Fabrizio letting us know that all is well at BC for our team and that they will plan to make a summit bid on Oct 1. The winds look to be reasonable for the 30th and 1st and as there are large crowds (some 400 climbers) our team plans to let the larger wave go first and be part of a smaller second wave. Due to the weather window constraints we will be launching our bid from C2 on the 1st very early (or perhaps ate on the 30th!) With so many days at BC, along with the runs to C1 and above, our team should have sufficient acclimatization for this. We have at least a week of time following this effort but the jet stream looks like it may be coming in for good and make summit attempts impossible. We will watch the weather carefully and hope for a later window as a back up. Our team has been passing the days at BC eating, resting and socializing and are all in good sprits. Fabrizio said that they have been catching with lots of friends on the mountain including a hungarian group he's know for many years, chris klinke, some folks from kari kobler's group and more. With so many people BC bound the teams are getting to know each other well! Given that the entire community of climbers and sherpas look to be converging in the high camps at the same time, we hope that this bodes well for cooperation up high! The weather has been much clearer and our group took advantage of the down day to amble over towards the Nangpa La and have a look about. 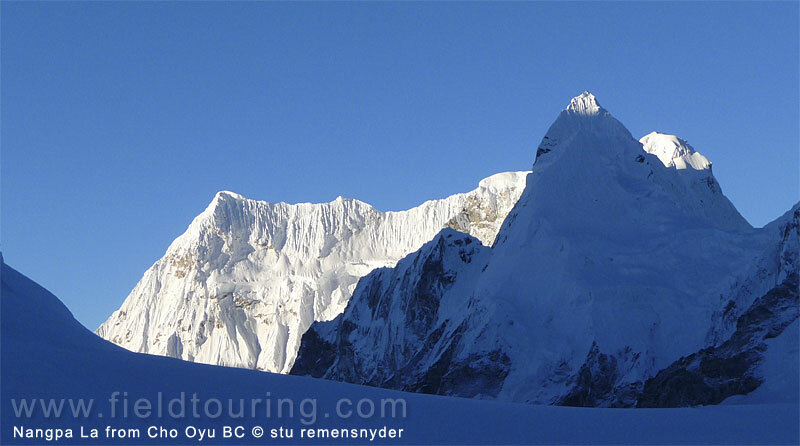 There are several peaks that the BC looks out at and some day we'll have to get a permit for them and come back for a "Cho Oyu Neighborhood Tour"! Fabrizio will post a gabcast audio dispatch tomorrow evening ahead of their departure on the 29th with all the latest. Stay tuned! FTA Cho Oyu 2010 - BC waiting! Our team has been sitting out the last few day at BC after trying to make a run to C1 and being turned back due to heavy snow and no reasonable prospect of being able to advance above C1. With the snow now subsiding and the winds picking our team will return to the hill for an acclimatization run and possibly a summit bid. All of our members are safe and sound and we'll let you know when we have more news! In 2008 the winds were quite heavy during an acclimatizing run to camp 2 and you can get a sense of how inhospitable the place can be in the high winds! Fabrizio called in today to let us know that there had been a significant snow fall, perhaps a foot or more, and that our team (along with most teams) have abandoned the mountain and returned to BC to await better conditions. With the slopes on the steeper sections, between C1 and C2 and above C2, now heavily loaded with fresh snow, there was little reason to climb up from C1 into dangerous territory. With this in mind Fabrizio, Siddhi, Luis and Gordon came back down to BC to await the upcoming window of clearer weather predicted to begin on the 24th & 25th. We still hope they can get in a night at C2 and return to BC before the winds are expected to rise on the 26th/27th. Farther down the road it looks like the wind will calm down again in early October so we'll be looking for a summit bid at that time. It sounds like the constant snowfall is taking its toll on the spirit of some of the climbers and Fabrizio said that quite a few people have called it quits and are heading out. To date our group remains in good spirits and is being well fed and entertained by the world's best disco dancer and cook, Ratna Gurung! Expeditions are hard no doubt and one of the most important skills to succeed is the ability to do very little for many days at a time while waiting for weather or conditions to permit you to head higher. Cards, reading, talking, practicing knots, writing in a journal, listening to music and more all have their place but often its the ability to just be content by yourself that can get you through these spells! "When it's getting dark, you're miserable and the task at hand seems endless, then this is the time to dig your sense of humour out from the bottom of your pack, wear it on your spirit and lighten your load." "In my daily task I draw on my Antarctic experience. If the work is important enough I do not knock off because I feel tired; one’s exhaustion point is a very long way past fatigue point. I think I have developed a greater capacity for thoroughness and I am more appreciative of the value of proper planning. Possibly the two most valuable things my expedition years gave me were self-confidence and persistence. Persistence allied with patience will overcome most difficulties." The amount of work is the same"
FTA Cho Oyu 2010 – Team in C1 and all is well! Our team is up in C1 the night on their second round of acclimatization and looking forward to spending the night in C2 at 7100m tomorrow! They have been enjoying the acclimatization period over the last 4-5 days and are ready to make a more serious push high on the hill. The past days have been filled with a run to C1 for a night, a 42nd birthday party for our cook Ratna, socializing with the many climbers on the hill (Fabrizio estimates more than 450), and surviving the daily snow fall which seems finally to be coming to an end. During this time a group of TMA (Tibet Mountaineering Association) climbers who were fixing the route above C3, were avalanched and a number of them were severely injured. Thanks to many climbers on the mountain they were helped down or carried down to BC. There is a full report on www.explorersweb.com including some very dramatic images and links to more reports of people involved first hand. Fortunately it sounds like all of the climbers will recover fully and the one climber needing a full evacuation was already out to the road head by early morning after he returned to BC. The constant snowfall on the mountain has made for avalanche prone slopes and it appears that this spell of snowy weather is coming to an end and will give way to clearer days and high winds. We hope that our team will be able to get acclimatization runs completed in the next 2 days and be ready for a good period of weather. We have still quite a few days as we are not due back into Kathmandu until the 12th of October but a number of teams are beginning to run out of days and are hopeful this upcoming window is a good one for being on the summit slopes! Fabrizio plans to call in gabcasts daily during this acclimatization run so visit the Field Touring Gabcast page to listen in to all of the past dispatches and check in daily to catch the new ones! • We have just added more climbers to our January 5, 2010 Ecuador Volcanoes trip and spots are becoming limited so let us know if you are interested! • We have also added an Aconcagua Polish Glacier trip starting on Dec 18 so come and celebrate the holidays on the highest peak in the Americas! See our expedition and trek and training pages for all the trips! 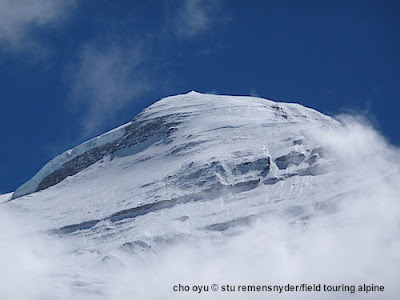 FTA Cho Oyu 2010 - C1 Established! Over the last few days our team has made the acclimatization runs up to C1 and established the camp site with tents and some gear. Despite a significant amount of snow fallingt they have been able to move quite easily from BC to C1 and back. Today they head up to C1 to spend the night for the first time and in the next day or two will hope to push up to C2 if the conditions permit. A few other teams have already made the trip to C2 so we know the route is open. The winds remain very low at this time and the temperatures have been quite warm. If the clouds do not drop too much snow our tem should be able to make some good progress on the hill in the days ahead. Fabrizio plans to post audio dispatches regularly and we’ll pass them on as we have them! We did have a good talk yesterday and he said that everyone felt great that they were looking forward to sleeping at C1 with the great views of the climb! FTA Cho Oyu 2010 In Base Camp! Our team is now safely settled into the official Cho Oyu BC at 5700mm and everyone is feeling well and ready for a well earned day of rest and relaxing tomorrow. Having completed the long journey to base camp, our team can finally leave behind the worries of travel, landslides, border crossing, permits and the like and focus on the objective before them. Some 3500 vertical meters of climbing now stands between our crew and the top of the 6th highest peak on the planet. With good luck they will begin to make an acclimatization run to C1 on Tuesday and make the first steps onto the 8,201m peak. We'll look forward to following their progress and hope for good weather and good conditions! Fabrizio has left a Gabcast dispatch in which he notes that there are quite a few expeditions in BC and a few more still to come. Among the expeditions are lots of friends from previous expeditions including our Makalu trip last spring and our Broad Peak expedition this past summer. Sounds like it should be a nice and friendly atmosphere for our crew. Fabrizio also mentioned that they had great fortune in getting their yaks on time and did not end up spending too many nights in Chinese BC (CBC) waiting for them. This can happen in some years when there are many groups arriving at the same time the demand for yaks is very high. The need to acclimatize for more than one night in CBC is limited so extra nights there essentially go against spare summit days. In 2008 and 2007 our teams had at least two nights and took the time to make acclimatization walk high in the barren hills near CBC. What this means for our team is that they are now 2-3 days ahead of schedule and this will give them more time for acclimatizing rest between runs up Cho Oyu. As the BC is so high members typically need more rest between acclimatization trips and a longer rest before a summit bid. We’ll expect to hear every few days from Fabrizio by Gabcast and will post them here! We have lots more trips filling up to Aconcagua, Ecuador, Kilimanjaro, Denali (upper West Rib), Nanga Parbat, Broad Peak, K2 BC and more! Visit the FTA site www.fieldtouring.com or drop us a note at info@fieldtouring.com for more! FTA Cho Oyu 2010 En Route to BC! Our Autumn 2010 Cho Oyu trip is well under way and has already reached CBC. Fabrizio called to check in and said that the trip to CBC was one of the easiest trips he has had in the mountains and must seem quite simple compared to the ride to Askole in Pakistan. The road is now fully (and beautifully) paved from lower Zhangmu all the way to Lhasa and the drive time was 1.5 hours from Zhangmu to Nyalam, 2 hours from Nyalam to Tingri and 45 minutes to Chinese BC. These numbers are almost unthinkable to anyone who travelled this road in the 80s or 90s when spending nights by the road side awaiting cleared landslides was not uncommon and even in good conditions these times were at least 5-10 times longer. As recently as 2008 when our last FTA expedition drove this route our times were still 3-4 times longer. The most difficult part of the drive was on the Nepal side where the road is still in very rough shape. Our Nepal agent, Nima, took two full days (normally 5-6 hours) to return to Kathmandu due to landslides and is now safely back in his office. The team spent one night in Kodari on the Nepal side of the border, crossed the next day and spent the night in Zhangmu before coming up to Nyalam the next day. The team then enjoyed two nights in Tingri (which they have nicknamed “the town of dogs” given the all night howling they encountered!) before the short ride up to CBC today. Along the way they have acclimatized well and are in good spirits as they finally get out of the car seats and onto their feet! The trek up from CBC is quite gentle and mostly along a road for two days until just a few hours from the Cho Oyu BC (ABC). We expect a gabcast disapatch on the 12th or 13th when they are safely ensconced in their rocky home looking out over the Nangpa La. Accompanying our team are two crucial staff members Ratna and Mama who have both been to Cho Oyu with FTA in 2008. Ratna has been a head cook on at least 8 FTA expeditions and is widely held as the best disco dancer in the Himalaya and in the top elite as a cook. Mama (Siddhi) has made the full growth on FTA trips from cook assistant to Sherpa guide over the last 5 years and we are very proud of his achievements and progress. In 2008 he was an assistant Sherpa on Cho Oyu and acquitted himself very well working the route up to C3. He is the best nepali teacher on our staff and our members are sure to be ready to gab it up in the shops back in Thamel at the end of the trip! Fabrizio has left a gabcast audio dispatch and we invite you to listen in on life at near 5000m in the Himalaya looking up at Tibetan Stars and across at Nepalese Lightning! Gabcast! Field Touring Alpine Audio Dispatches #105 - FTA Cho Oyu 2010 Autumn - Team in CBC! Fabrizio calls in from Chinese Base Camp (CBC) to let us know that all is well! The team has been acclimatizing well and they are leaving on the 11th for IBC and then hope to reach Cho Oyu BC (ABC) on the 12th. Great weather with views to lightning storms have added lots of ambience!